2. Dory asks random sea creatures where her parents are. Which animal is not one of them? 3. Remember that time when Nemo was lost and Marlin and Dory encountered a gang of sharks? How many sharks were there, according to Marlin? Really? That’s your question? Skip to the next one already! 4. Do you remember who Kathy is/was? You sure? When Mr. Ray lectures about their field trip to the stingray migration, what is Kathy’s response? 5. Speaking of member berries, Dory finally remembers her parents. Where are they currently? 6. What is “the Jewel of Morro Bay”? 8. Dory ends up in the Jewel of Morro Bay. Where do fish who aren’t qualified for marine life end up? 9. Hank the octopus helps Dory find her parents. How and where did Hank lose his tentacle? 10. 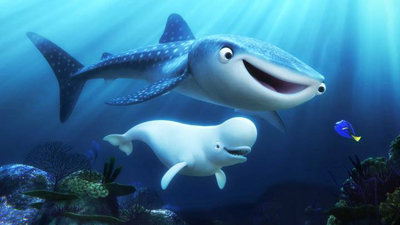 Dory meets Destiny, a nearsighted whale shark who was her childhood friend. What is their friendship name? 11. Destiny suggests that Dory find her parents in Open Ocean. Which is not one of the mishap names she calls her destination? 12. Meanwhile, Marlin and Nemo seek help from a disabled bird named Becky (thanks to Fluke and Rudder) to take them to the Quarantine building. How does it backfire? 13. While trying to call back Becky, where do Marlin and Nemo unsuccessfully end up? 14. Meanwhile, if you recall about Hank’s missing tentacle, Dory ends up in the Kid Zone. Which sea creature in the Touch Pool is not included? 15. Speaking of clams, what is the clam’s story? 16. Which animal was his date? 17. Dory finally reaches the Open Ocean. Which event from her childhood does not flash in her eyes as she discovers her old home? 18. What was Dory trying to do before she became lost? 19. What was Dory’s tag number? 20. Dory, Marlin, and Nemo find the Quarantine Room and land into a crate full of which fish? 21. Destiny and Bailey use their echolocation to find the truck shipping to Cleveland. What distracts Bailey during his search? 22. As if we didn’t educate you on marine biology enough, let’s talk about the three R’s. What does the second R stand for? 23. Hank drives the truck to retrieve Dory to the water. Which street do they exit on the roundabout? 24. In a game of hide and seek, who does Dory find first? 25. Which is not a camouflage/hiding spot for Hank at the end credits?